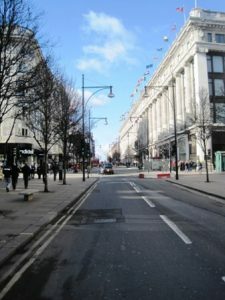 Oxford Street is probably the most famous shopping street in London. It is approximately 1.5 miles long and has about 300 shops. Just beyond its eastern end of Oxford Street is the distinctive Centrepoint which is a 34 storey glass and concrete tower visible from much of Oxford Street and useful for orientation. Oxford Street runs from Totenham Court Road station (closed to all but Northern Line trains until 2016) in the east to Marble Arch station in the west. About halfway along its length is the junction with Regent Street at Oxford Circus, this junction has recently been provided with diagonal pedestrian crossings so that it is not only possible to cross the junction in a north-south or east-west direction but also north-west to south-east and north east to south-west. Surprisingly, perhaps, this configuration has worked well. Oxford Street is anchored by a number of big name department stores including the famous Selfridges and is the home of the flagship stores of many successful retail chains. It lies at the heart of a much larger shopping district with Regent Street andBond Street and smaller streets towards the centre specialising in top end fashion, Totenham Court Road toward the north-east in consumer electronics, Charing Cross Road and Denmark Street to the south-east in books and musical instruments and Edgware Road to the north west in electronic components.